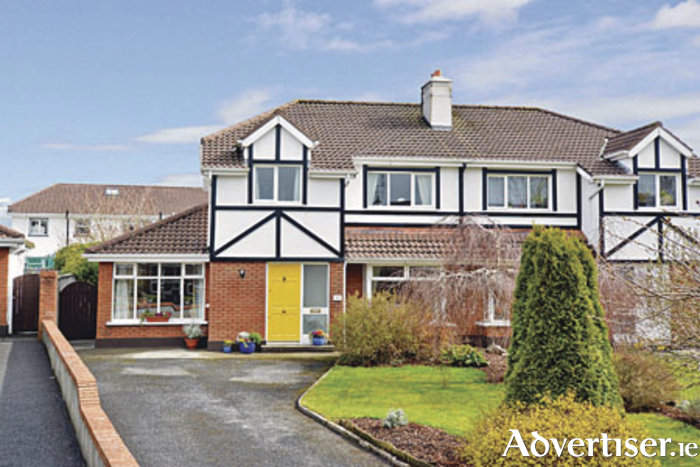 Sherry FitzGerald is offering No 37 Tudor Vale, Oranmore, for sale by private treaty. This large three/four bedroom property is located in the established development in Oranmore and would make a lovely family home within walking distance of all local amenities. The property is located in a cul de sac to the rear of the development and boasts mature gardens to the front and rear. Size is 125sq m (1,345sq ft ) approximately. Accommodation on the ground floor comprises living room with solid fuel fireplace, kitchen/dining room, second reception room/fourth bedroom, utility room, and guest wc. There are three bedrooms on the first floor with master en suite and the main bathroom. The BER is C3 on BER cert no 107437386, with an energy performance indicator of 224.9 kWh/sq m/yr. All rooms are well proportioned and offer space and light throughout. The development was constructed in 1990 and schools, shops, and local services are within walking distance. The M6 Galway/Dublin motorway is easily accessible within minutes’ drive, with Renville Woods and Galway Bay close by offering scenic walks. Asking price is €257,500 and viewing is recommended. An open viewing will take place on Saturday April 18 from 10am to 10.30am.